High Quality Entry level Kendo uniform for everyday practices. The Kendogi is made of a single layer, 100% Cotton, dark navy blue fabric. The shoulder has an reinforcement that will protect from rubbing with the Do Himo. 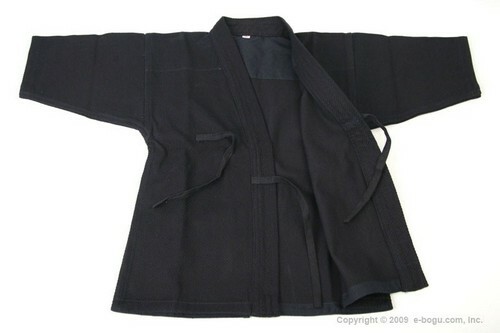 The Hakama is a blend of Cotton and Rayon. If you are starting Kendo, or need an extra set of uniforms, this is the one to get. Light Weight Hakama will be discontinued. 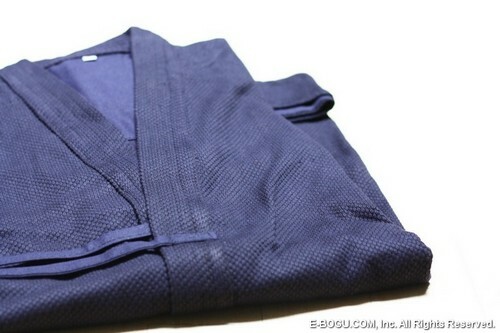 This Kendogi is 100% Cotton, dark navy blue. The shoulder has a reinforcement that will protect from rubbing with the Do Himo. Nice set, I bought for a Kid and, for training, that set is satisfactory. I'm happy with the quality of the product and the customer service I received when ordering. The nice people at e-bogu were helpful with finding the right fit (I'm a large person) and making sure that the embroidery was correct. Overall I'm very pleased with this purchase. UPDATE: I've used this uniform for over six years now. It's been pretty well abused during that time, but it's hanging in there just fine. The colour doesn't fade in the same way as a shoaizome dyed uniform. The hakama have turned a fairly even medium blue, while the gi has faded more unevenly, and with an almost purple tint in the most faded areas. The fabric has held together nicely, with no worn out areas or tears, and the little strings for tying it closed are still intact. The areas where the dou himo cross over my shoulders has not worn out like I've seen on other gi of comparable age. It is functional and durable in its old age, if not as pretty as a traditionally dyed set. Great attention and great quality product! Fast shipping, and great quality product! Keikogi quite suitable for the hot Caribbean climate. Decent quality for the price.